The Interplanetary Scintillation Array, which is actually a much smaller collection of wires near grass level, behind the more prominent 4C Array telescope in the foreground. Creative Commons Attribution-NonCommercial-NoDerivatives image by Flickr user Tom De Mulder. There is a much better (copyrighted) photo of the Interplanetary Scintillation Array here. In 1965, Susan Jocelyn Bell began her doctorate studies in physics. Her supervisor was Antony Hewish of the Cavendish Physics Laboratory at the University of Cambridge. Hewish, together with Martin Ryle, had built the world's first radio interferometer telescope in the years following World War II, as mentioned in a previous annotation. Radio astronomy was an exciting new field which had led, in 1963, to the discovery of quasars. 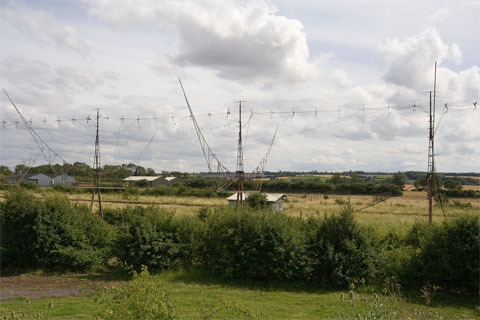 Jocelyn's (she preferred to use her middle name) first task was to help Hewish and Ryle build a new radiotelescope, the Interplanetary Scintillation Array at the Mullard Radio Astronomy Observatory in the countryside just south-west of Cambridge. Interplanetary scintillation was the newly discovered phenomenon by which radio waves from astronomical objects vary slightly in intensity as they pass through the ripples and currents in the ionised plasma of our sun's solar wind. Our sun emits electrically charged particles in an irregular fashion, and these interact with radio waves coming in from deep space. The resulting scintillation is similar to the visible twinkling of a star seen with the human eye (which is caused by similar random irregularities in the Earth's atmosphere). This new telescope was a collection of 4096 simple radio antennae, spread out over four acres of land. It operated on a similar principle to Hewish and Ryle's first radio interferometer, allowing it to be "pointed" in various directions on the sky by electronically delaying the electrical signals from the separate antennae by various amounts, to precisely simulate the delays they would experience if the entire telescope was physically tilted to different angles. The major new capability of this telescope was that it could record any variation of the incoming radio signal strength with time, down to a resolution of about a tenth of a second. All previous radiotelescopes needed to combine signals over several seconds to record a detectable signal. This was not considered a problem, because up until Hewish figured such a thing might be possible in 1964, nobody had thought astronomical radio sources could vary in strength on such short timescales. Jocelyn helped build the new telescope and it was completed in early 1967. Hewish then gave Jocelyn the job of surveying the sky for scintillating radio sources using the new high time resolution of the instrument. This was routine sort of work, scanning the telescope around and looking for any interesting "twinkling" of radio emissions. In July of the same year, Jocelyn made an astonishing discovery. 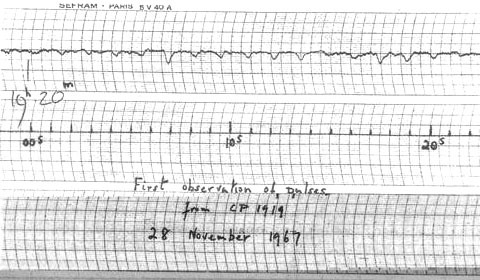 Image of the first recorded signal from the pulsating radio source discovered by Jocelyn Bell. The top line shows the received radio strength changing with time; higher strength is plotted downwards. The bottom line shows 20 seconds of time. Image may be copyright Mullard Radio Astronomy Observatory, used under Fair Use for educational purposes. When the telescope was scanned across a patch of sky in the constellation of Vulpecula, it picked up a signal that varied with time. Going back to locate its position and measure its scintillations more precisely, Jocelyn noticed that it wasn't varying randomly as would be expected from interplanetary scintillation. Instead, this one beeped. The radio signal was recorded as a trace of ink on a roll of paper, with the movement of the pen controlled by the strength of the radio signal received. Normally the pen trace would rise up from background static as the telescope tracked on to the target, then stay moderately steady for as long as the telescope remained pointing at it, with some slight variations caused by the scintillation she was looking for, plus random noise in the telescope. But this source was different. The trace remained at the background static level, and only spiked into a noticeable signal intermittently. Over several nights of observation, Jocelyn noticed that the tiny spikes in emission seemed to be regular, repeating every one and a third seconds. When she reported this strange signal to Hewish, he assumed it must be radio interference of some sort, generated on Earth. There could be no other possible explanation for a radio signal that repeated with beeps at such regular intervals. Jocelyn went back to the telescope and collected more observations. She showed that the signal only occurred when the telescope was pointed at a particular spot in the sky. And it tracked the movement of the stars, not the rotation of the Earth. And it persisted in beeping regularly, every one and a third seconds. Hewish and Bell realised the signal couldn't be generated on Earth. And they couldn't conceive of any naturally occurring astronomical process which would generate a radio signal that beeped with the precisely timed regularity of a lighthouse or beacon. The only conclusion they could come up with was that the signal might actually be a radio lighthouse or beacon, produced by some extraterrestrial civilisation. 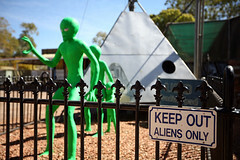 As good scientists, they were very cautious about this conclusion, but it didn't stop them referring to the source using the code name LGM-1, short for "little green men, source 1". Was it a message from aliens? We did not really believe that we had picked up signals from another civilisation, but obviously the idea had crossed our minds and we had no proof that it was an entirely natural radio emission. It is an interesting problem - if one thinks one may have detected life elsewhere in the universe how does one announce the results responsibly? Who does one tell first? [We] decided that, if this [hypothesis] proved to be correct, they could not make an announcement without checking with higher authorities. There was even some discussion about whether it might be in the best interests of mankind to destroy the evidence and forget it! But Bell made further astonishing discoveries with the telescope. She found a second beeping radio source in the sky, this one with a period of about 1.2 seconds. It was in the constellation of Hydra, a long way from the first source. And then she discovered two more. By January 1968, Bell and Hewish had detected four regularly beeping radio sources in the sky, all with periods a bit longer than a second. Had they discovered some sort of alien navigation beacon network, with each signal station broadcasting at a different rate so they could be identified by spaceships? They considered this increasingly unlikely, as the interstellar distances between the sources were enormous. The alternative, that they had discovered multiple alien civilisations, and they all chose to broadcast signals of approximately the same type, they considered so unlikely as to not be realistic. In the end, science won out and Hewish and Bell published an announcement of their discovery in 1968, playing down the alien theory and simply stating that they did not know what was causing the regular radio emissions. James Chadwick as we've discussed previously, discovered the neutron, the third and final particle that makes up all of the atoms in the universe, in 1932. Two years earlier, in 1930, Indian astrophysicist Subrahmanyan Chandrasekhar had made a somewhat disturbing calculation using the relatively new findings of quantum physics. (Since we haven't discussed quantum physics yet, I'll skip over some of the details here.) Chandrasekhar basically calculated that if a star ran out of nuclear energy to keep it shining and stable, and it contained more than about 1.4 times the mass of our sun, then the force of its own gravity pulling itself in together would be greater than the repulsive force of the electrons in the star. And with no nuclear energy to provide outward pressure, there was nothing left to "hold the star up". In other words, a star that big, when it runs out of nuclear fuel at the end of its life of shining, must collapse under its own gravity into... well, Chandrasekhar had no idea into what. The physics hadn't been worked out yet. 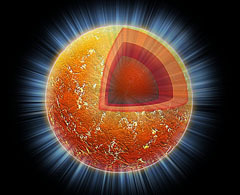 Visualisation of a neutron star, with interior cutaway. The star is 10-20 km across. Creative Commons Attribution-NonCommercial illustration by NASA/CXC/M.Weiss. In 1934, Walter Baade and Fritz Zwicky integrated the work of Chandrasekhar and Chadwick to solve another problem: Where did supernova explosions get their tremendous energy from? A supernova is the violent explosion of a star at the end of its life. Astronomers knew these explosions released a tremendous amount of energy, but they didn't know how it was generated. Baade and Zwicky took Chandrasekhar's limit, and Chadwick's neutrons, and proposed that stars larger than 1.4 solar masses, when they ran out of nuclear fuel, would collapse under gravity beyond the ability of electron repulsion to hold the star up, ending up as a tiny dense ball of neutrons, only a few kilometres across. The amount of energy released by the gravitational collapse from the size of a star to the size of a compact city would be plenty to power that seen in supernova explosions. What was left over, the tiny compact ball of neutrons, Baade and Zwicky called a neutron star. They also stated that neutron stars, having no further source of energy, would not be detectable from Earth by any means. When Bell and Hewish published their paper in 1968, announcing the mysterious pulsating radio sources, it started a wildfire among theoretical astrophysicists trying to work out what they could be. Just a few months later, Thomas Gold solved the puzzle. He realised that stars (1) have magnetic fields, and (2) are rotating. When a star blows up in a supernova and collapses down to a neutron star, firstly the magnetic field collapses as well, resulting in an extremely compact and powerful field around the neutron star. Secondly, as the star collapses, its spin speeds up, in the same way as a spinning ice skater rotates faster as she draws her arms in. And because it's such an enormous collapse, from the size of a large star to a sphere just a few kilometres across, the speed up in spin rate is huge. If you do the maths, the star goes from spinning once every few days, to roughly once a second, or even faster. 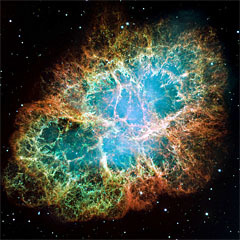 Hubble Space Telescope image of the Crab Nebula. Creative Commons Attribution image by NASA, ESA, J. Hester and A. Loll (Arizona State University). Yep. Thomas Gold realised that the rotation rate of neutron stars should be roughly the same as the pulsation rate of Bell's mysterious radio sources. And, what's more, neutron stars would have an immense magnetic field. They were, in effect, giant spinning magnets in space. And when a magnetic field moves through space... you should know the drill by now... it generates a moving electric field, which generates a moving magnetic field, and the whole shebang can travel through space at the speed of light as electromagnetic radiation. As radio waves. And if the poles of the magnet are not aligned with the poles of the spinning neutron star, and a magnetic pole happens to sweep past the Earth once on each rotation... what we would observe from Earth is a regular pulse of radio waves, approximately once per second, and keeping time extremely accurately. Within a few more months, similar pulsating radio sources were discovered in the Vela supernova remnant, and then, really clinching the deal, bang in the middle of the Crab Nebula, which was already known to be the remains of a supernova explosion that was witnessed on Earth in the year 1054. The source in the Crab was much faster, pulsing at an astonishing rate of 30 times per second. This matched Gold's theory, which said that neutron stars should be born spinning really fast and will slow down over time. So younger neutron stars should pulse with higher rates. What Jocelyn Bell had discovered was a way to observe neutron stars, and a completely new class of astronomical objects that we could study and use to probe the universe. Now shown conclusively to be naturally occurring objects, the LGM designation was dropped and the objects were christened pulsars. Now there are over 2000 known pulsars. And pulsars have helped us learn a lot of surprisingly diverse stuff about the universe around us. They make fantastic probes of the interstellar medium that pervades our Galaxy. We can use them to map the distribution of stars in the Galaxy and nail down our own solar system's position. They've revealed information about planets. And they make superlative tests of some of our most fundamental understandings of physics: Einstein's special and general theories of relativity. In 1974, Antony Hewish and Martin Ryle were awarded the Nobel Prize in Physics. The citation read: "for their pioneering research in radio astrophysics: Ryle for his observations and inventions, in particular of the aperture synthesis technique, and Hewish for his decisive role in the discovery of pulsars". In one of the most controversial omissions in the history of the prize, the Nobel Committee overlooked Jocelyn Bell. However, Bell, who became Jocelyn Bell Burnell when she married Martin Burnell in 1969, has received many other academic awards, and in 2007 Queen Elizabeth II appointed her as a Dame Commander of the British Empire. This is because of the conservation of angular momentum - a principle of motion that I haven't talked about before. The principle is identical in the ice skater and neutron star examples. The female equivalent of a knighthood, and the same rank as Jane Goodall! Title image shows the Molonglo Observatory Synthesis Telescope, which was converted from the former Molonglo Cross Telescope on the same site. This instrument discovered almost 200 pulsars. Last Modified: Sunday, 22 April 2012; 03:11:02 PST.